Meditation has helped me so much in so many ways. On the most subtle level, it has helped me see within, go within and be and feel comfortable there. On an outer level, it has calmed me down in ways that those around me can appreciate. On very hectic days, those in which I have a long list of things to do, a few minutes of mediation in the morning helps me look at that list and know what must be done and what can wait. When I am overwhelmed, a few minutes of quiet stillness helps me find my center, my balance. When I am angry, meditation allows me to see what I appreciate in my life, turning my mood around and changing my perspective. When I feel lost, I go within to find my way out. As a writer, meditation has become an essential tool. It has become such an integral part of my writingness that I no longer consider one practice separate from the other. We receive constant input from what we read, the conversations we have, the news, the music we listen to, the movies we watch and various other sources. It is present, never-ending and ambitiously seeks our continual attention. This hinders our ability to think fresh thoughts, to be ingenious. It keeps our focus on the stimuli in our environment. In order to make room for new content, we must be able to shift our focus. This is where meditation helps, where it becomes a conduit for new ideation. Meditation helps us come to and into our writing. There are two forms of meditation that I use as part of my writing. I sit in lotus pose with my eyes closed and meditation music in the background for twenty minutes while I focus on my breathing. It is a process, a cycle in which I enter full and come out empty, calm and ready to receive. 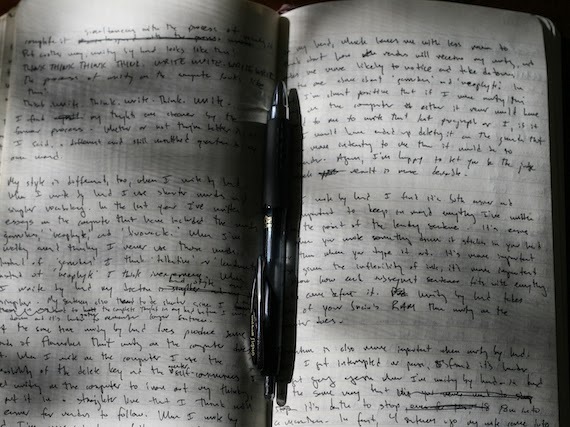 I also practice a flow-of-thought writing exercise in which I let my thoughts pour out without judgment, censorship or plan in a notebook for a good two or three pages. This is where some of my best writing has come through. I always write by hand for there's more to a poetic movement in writing by hand, there's a connection between our handwritten action and the brain. When we write by hand, our brain receives feedback. This helps us resolve and clear our psyches of many issues, thus making room for inspired ideas. Meditation is not only great for writers, but for every creative type. If you're struggling in your work, are doing great in your work, feel a creative urge but haven't figured it out, want to explore your creativity or just want to keep ideas flowing, I encourage you to meditate and enjoy the flow.